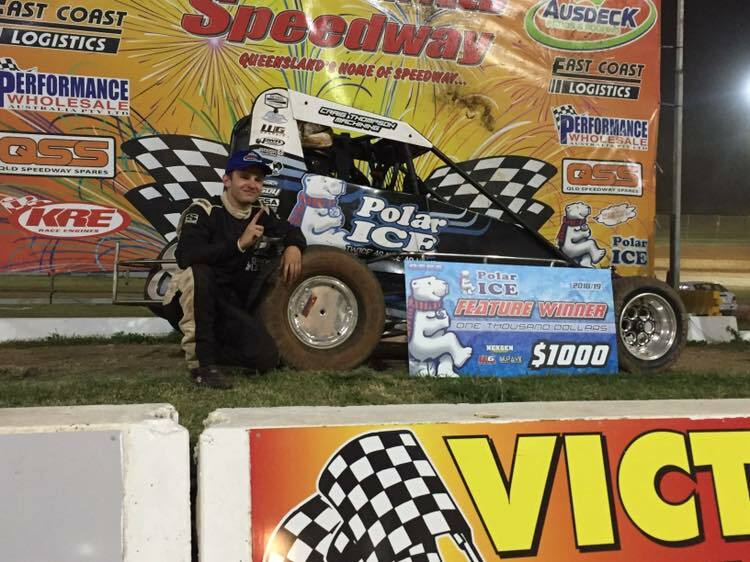 After a slow start to the season, for many varied reasons, Rusty Whittaker led from the green to the chequered to win Round 3 of the Polar Ice Midget Series at the Ausdeck Patios Archerfield Speedway on Saturday November 24. Whittaker’s night started well carrying the new Polar Ice livery and even before he had turned a wheel, when he drew the right marble at the driver’s briefing to make it the double points round for the season. He then set the fastest time (14.170) during hot laps to get 66 valuable points. He then finished top of the qualifying points to garner the pole position for the 20 lap A Main. After three days of high winds the track was dry and slick for the feature despite John Kelly’s best efforts to keep some moisture in it. Consequently, the initial start only made it to the first turn when New Zealander Ricky McGough (position 3) spun around but was miraculously missed by all the following cars. The bad news was he was ROF for the second start. The field was away cleanly on the restart with Whittaker leading the pack while Harley Smee (NSW) jumped from the second row to get ahead of Braydan Willmington (NSW) during the opening lap to snare second. Further back Mitchell Rooke, Chris Singleton and Cal Whatmore were doing their best to stay in touch with the lead group while McGough was on the charge from the back. Whittaker opened a small break while Smee had Willmington all over his rear push bar trying to find a way past with Rooke now on Willmington’s tail. McGough had fought his way back to ninth just before the half way point when an unfortunate incident occurred at the end of the back when McGough and rookie Bodie Smith tangled and rolled together finishing near the pit exit gate. Both cars suffered damage but the important thing was that both drivers, although shaken, were uninjured. Whittaker continued to dominate from the next start to claim his first feature of the season ahead of New South Wales duo Smee and Willmington with Rooke and Whatmore next. Smee is the nephew of former Australian Speedcar Champion Nathan Smee, one of the best slick track drivers in the country, and obviously has learnt some things from his uncle. Whittaker won the opening heat after starting from the fourth row with Tim Farrell following him home. Farrell showed no ill effects of the heavy tumble he took at Toowoomba a couple of weeks prior. Rookie Tom Clauss joined the ‘wheels up’ club when he slapped the wall in the main straight and rolled on to his side. His night looked to be over with a bent rear axle but Dylan Byrne, owner of the Nexgen Transport # 46 driven by Ricky McGough, came to the rescue and offered his spare diff and Clauss was ready for the feature. Charlie Brown was also a non-finisher with his engine not sounding right and he took any early mark so that the problem could be properly investigated. Smee won the second heat with Darren Vine a DNF after his Turbo Esslinger dropped onto three cylinders before the race began and he decided to park the car for the remainder of the night. Mitchell Rooke chalked up a win in Heat 3 and then Willmington was successful in the last qualifier to give four different winners for the four preliminaries. Willmington is an enthusiastic individual who recently contested the BC 39 midget race at the famed Indianapolis Motor Speedway and is keen to get more American experience in the future. Bodie Smith is the nephew of former Brisbane compact and speedcar racer, Craig Smith. At just 16 years of age he is the youngest driver to join the ranks since Rusty Whittaker some years ago. He has served his apprenticeship in F500 (Juniors) and Compacts and will continue to contest all the Compact events for the season and will race the speedcar when his schedule permits. In difficult conditions he kept the bigger more powerful car straight and steady and was able to pass cars when openings became available. His accident during the feature race was most unfortunate. All the Brisbane speedcar fraternity are pleased to have him as part of their group and know that he has a bright future in the sport. Things didn’t go right for the other driver who had travelled the 1000 kilometres from Sydney, D J Raw. An engine miss hampered him during the preliminaries but after some quick work the car was sorted for the feature. He started from the back but kept moving forward for a top 10 finish. Brad Harrison fronted for his first night of the season with his new car, an American Bullet chassis with a Toyota engine. Unfortunately, a couple of opening night gremlins struck but ‘Watch this space’ as the season progresses and the ‘Most Improved Driver’ from the 2017/18 season gets the Toyota running right. His brother, Riki, is also making his presence known despite only a couple of shows in a midget so look out for the Harrison brothers in the future. 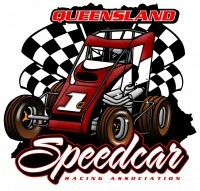 Brisbane speedcar racing has seen a lot of brothers in action over the decades including the Jeffersons (Twins), Brian and Ian Finglas, Kelvin and Rob Hamilton and the McDowells, Gavin, Jason and Shane. The midgets return to Archerfield in a fortnight (December 😎 for Round 4 of the Polar Ice Midget Series. With still more cars to appear for the season and a couple of new drivers set to make their debut around Christmas time the racing will just get better and better. The annual Stan Burrow Stampede is scheduled for Friday January 4 at Archerfield and will again offer some significant prize-money. It is a race in memory of former long-time speedcar driver Stan Burrow and it is planned that a special unveiling will take place on the night. Once it is confirmed details will be revealed. It is a night not to be missed by every midget follower.